Are you a country mouse or a city mouse? I guess I would say I’m a country girl. After I graduated from college in Washington, DC I was dying to have a home of my own and when I pictured what it would look like I just didn’t think “city”. I think thats why Frank and I ultimately settled in the town of Bronxville, NY after college. I still can’t believe we bought a place in the suburbs at the age of 22 (EEEK!). It ended up being the best of both worlds because after a less than 25 minute train ride we would find ourselves in the middle of NYC. Similar to the length of time it takes to get from Brooklyn to Grand Central. For me it was perfect. 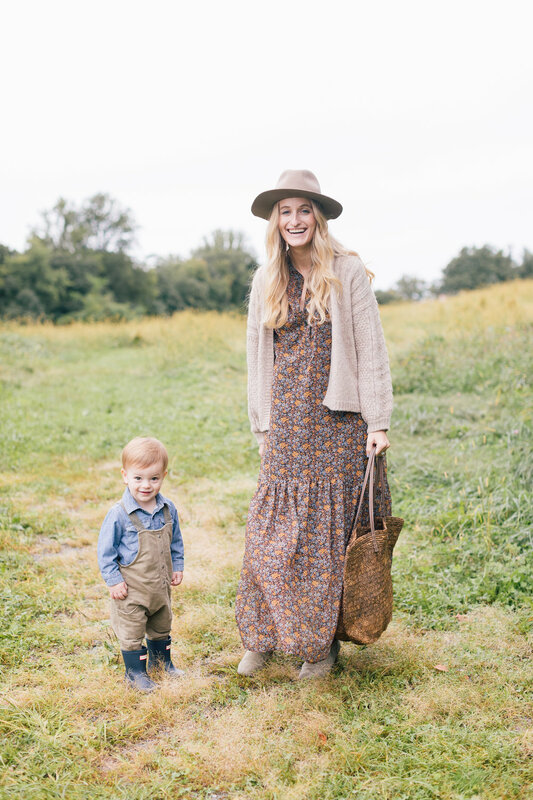 Posted on October 5, 2018 by Stephanie Trotta and filed under What to Pack and tagged blue hill at stone barns hunter boots children's hunter boots hat attack hat cesta collective chloe scarf marc fisher boots mango maxi dress raffia tote velvet by graham & spencer open sweater mom life zara kids overalls.